Goossens, C. (1989). Aided communication intervention before assessment: A case study of a child with cerebral palsy. Augmentative and Alternative Communication, 5(1), 14–26. Goossens, C., & Crain, S. (1986). Augmentative communication assessment resource. Wauconda, IL: Don Johnston Developmental Equipment. Abstract. A systematic review of research on the effects of interventions that include communication partner modeling of aided ...... Aided communication intervention before assessment: A case study of a child with cerebral palsy. 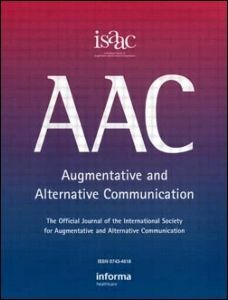 Augmentative and Alternative Communication, 5, 14-26. doi:10.1080/07434618912331274926.